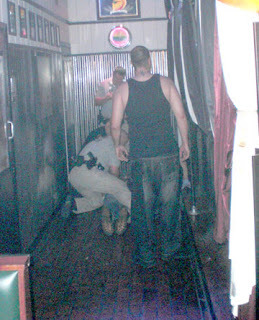 The Fort Worth Texas police department conducted a raid on the gay bar Rainbow Lounge on the 40th anniversary of the Stonewall Inn raids, arresting seven people for public intoxication. Police have been accused of excessive force and 100 demonstrators showed up Sunday night in downtown Forth Worth to protest the raid. The not awesome thing was the paddy wagon of homophobic police that showed up ... looking for trouble. My group and I were sitting on the back patio at a picnic table. Nobody was being wild out there. [The police] came through with flashlights, being loud asking what was going on out here, then asked why everyone was all the sudden being quiet. When one group started up their conversations again, they took one guy away. 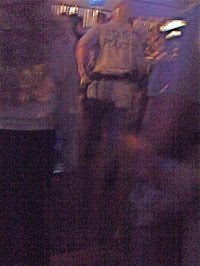 I left shortly after and as I walked through the front bar there were numerous cops with plastic handcuffs all ready to go. I [left] the bar and they [had] a big van in the parking lot and numerous cars on the street. And just so you know, it wasn't fire hazard crowded or seedy wild in there. ... The worst part is [friends later told me] that [the police] had numerous people face down on the ground outside. I just moved to Fort Worth from Dallas, so this is such a shock to me. I know Dallas would not put up with this. ... I am still so shocked it is 2009 and this just happened. One of the patrons who was arrested is reported by his sister to have been roughed up so badly that he's in the hospital, suffering from bleeding in the brain. “It doesn’t matter who you are or what kind of bar you are in,” she said, “none of this should have happened, to anybody. It’s excessive force, and it shouldn’t have happened." Police disputed the accusation of excessive force and said the department would thoroughly investigate any allegations. The raid was one of three bar checks conducted by police and agents from the Texas Alcoholic Beverage Commission. Police said two intoxicated individuals made sexually explicit moves toward officers and a third grabbed a TABC agent’s groin. Several patrons told the Fort Worth Star-Telegram that the officers weren’t assaulted. "He was just walking to the bathroom when an officer grabbed him and shoved him against a wall and pulled his head back," said Chris Hightower of Fort Worth told the Star-Telegram, a friend of the injured patron. "He was then thrown to the ground, and three other officers were on him." Several patrons said the officers were never assaulted. "I have friends who are cops, and I know what to do when officers are working," Camp said. "No one was acting aggressive to officers." General manager Randy Norman said the bar had been open just a week, and it had complied with all ordinances. "Rest assured the people of Fort Worth, or the government of Fort Worth -- will not tolerate discrimination against any of its citizens," Fort Worth Councilman Joel Burns stated to Fort Worth CBS 11 who has a news video report. He's now calling for accountability. A Facebook Group has formed to keep the community abreast of the situation and informed of future demonstrations. Fort Worth police are known for being very Paddywagon-happy. I also just moved to Fort Worth in March and my first experience were Fort Worth police just waiting outside restaurants and bars that line the square with two paddywagons. One girl was being arrested and a big guy had her seated on the curb and would not let her up. He underwear were showing and her spaghetti straps were coming down. People were taking pictures and when she tried to fix it the officer pushed her down and yelled that she was resisting arrest. She had a big whelp on her head and she was pretty tiny. This was really scary. I don't even go by the square for a single drink now. Happy 4th of July! Our Equality Is Inevitable.